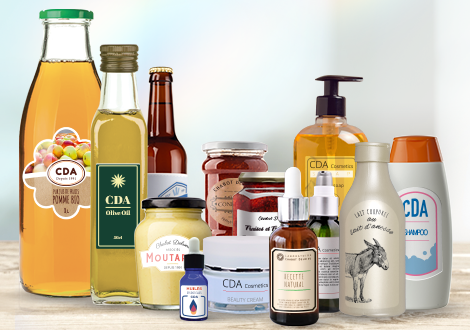 As a manufacturer of packaging machines, CDA has designed a wide range of filling machines / screwing machines / labelling machines that adapt to the specificities of organic and natural products. These products (fresh organic fruit juice, organic compote, natural cosmetics, organic alcohol like beer…) have characteristics that we have taken into account to design the filling, screwing and labelling machines best suited to your needs (precision, speed, product packaging, etc.). Organic and natural products are in high demand because they respond to the growing trend to become “actors” in their own consumption. Whether in the food industry with organic products or cosmetics, coating and even chemistry with natural components, many sectors are going green! All these products are projects to which it is necessary to provide a packaging solution both at the level of filling as well as capping or labelling. CDA provides you with a solution that perfectly suits your problems: we have designed filling machines adapted to the dosing of different types of liquids (pasty, foamy, fluid), labelling machines adapted to the different shapes of containers (cylindrical, rectangular, oval, conical) and complete packaging lines (allowing filling / screwing / labelling). Your organic drinks, cereal bars, plant cosmetics have found their ally for their packaging: CDA! Semi-automatic filling machines allow the dosing of small productions. We have developed machines that can be equipped with different types of pumps in order to be able to dose the majority of biological products: viscous, pasty or fluid. Monoblocks allow filling, capping, screwing and labelling to be carried out on a single machine. Monoblocks are specialized in the dosing of liquid products for cylindrical containers. Many organic products can therefore be packaged by these machines. Natural products cover a wide variety of business sectors, from organic food (spices, organic juices, natural preserves, kombucha…) to natural cosmetics (organic lip balm, creams made with natural products…). Thus, expectations are plural: the rates, dosing accuracy, diversity of labelling, etc. are all varied needs. And yet, one expectation remains common to all these companies: to benefit from a trusted partner for the acquisition of its packaging tools. CDA is known in the profession thanks to the support it provides to many of its clients. From project management to machine start-up and training, our satisfaction lies in the implementation of your projects. Concerned about its environment, CDA values a responsible approach by offering quality machines, designed and manufactured to last. CDA promotes collaboration with local suppliers and manufactures most of the parts that make up its machines in-house. By controlling its production from A to Z, CDA is able to offer a high standard of quality with robust and durable machines. As proof, our first machine, designed in 1991, is still working. In addition, we promote the optimization of CDA machines. Indeed, many of them can be manufactured in an evolutionary way (for example, possibility of adding a labelling station) to assist you throughout the growth of your company’s activity. We are sure of it; we will be able to enhance your production by offering you the packaging tool perfectly adapted to your expectations. Contact us so that we can discuss your project! Natural products' smallest productions can be easily packaged thanks to the acquisition of a semi-automatic machine. These filling, screwing and labelling machines enhance organic production by providing high dosing and labelling accuracy. Several machines have been developed to meet the specific requirements of our customers' projects. SMEs operating in the organic sector often have larger packaging needs: the rates are higher and the product range is wider. Automatic filling and labelling machines provide a suitable solution for companies with a large production capacity. Their versatility, robustness and ease of use are key elements highlighted by our customers. Large groups will discover in our various equipment the solution for packaging their products. We offer machines that can be integrated into your existing packaging lines. We can also offer you complete and tailor-made chains thanks to our engineers and project managers' team. You have a single point of contact for the acquisition of a complete packaging line, thus saving time and efficiency.